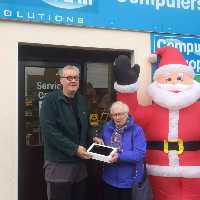 Here is a photo of Pat receiving her prize of an iPad 2 from Gordon Munro and Santa. Have you entered our latest prize draw yet? We've got another superb iPad 2 for the winner! Enter now by Latest Prize Draw.